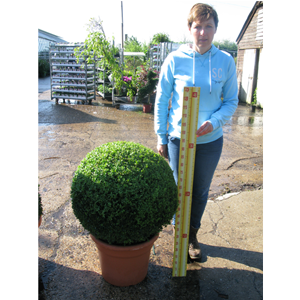 Buxus Sempervirens Ball (Box Hedge Ball) is a dense evergreen shrub and is quite slow growing yet very long lived.This plant can be kept in shape by clipping once annually. Please note - this item requires a pallet delivery due to its weight, it is therefore not included in the free delivery offer. Please call for the charge for pallet delivery.